Chelsea host top-of-the-table Manchester City in Saturday’s Premier League action. 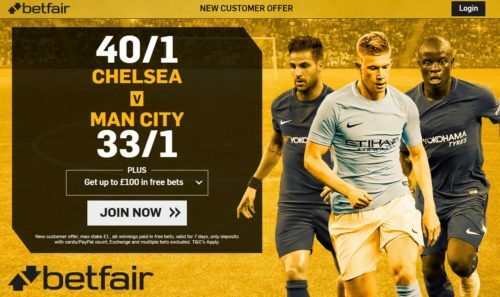 We take you through our match preview and betting tips for the eagerly anticipated fixture at Stamford Bridge. These two sides have met 142 times competitively in their history, with Chelsea winning 57 times (40%), Manchester City 45 (33%) with 38 draws (27%). Antonio Conte’s side won both meetings last season – a 3-1 victory in Manchester in early December before a 2-1 win at Stamford Bridge in the title run-in. Fixtures between the clubs have recently produced a lot of goals with 19 flying in during the past five meetings. City’s last victory at Stamford Bridge came in April 2016 when Sergio Aguero hit a hat-trick for the visitors in a match when Thibaut Courtois was dismissed. In total, there have been three red cards in the last three meetings between the two. Chelsea have won only one of their three home matches this season – a win over Everton sandwiched between dropping points to both Burnley and Arsenal. No side has scored as many league goals this season as Manchester City (21) while only city rivals United (2) have as strong a defensive record. Indeed, City have found the net 24 times in their last six matches in all competitions – an average of four per game. Conte’s side meanwhile have only conceded four goals in their last eight fixtures in all competitions. Sergio Aguero has scored five goals in his last four matches at Stamford Bridge, while Eden Hazard has scored four in his last four games in the fixture. Chelsea’s one absentee is midfielder Danny Drinkwater (calf). City will be without left-back Benjamin Mendy (knee) amid fears he could miss up to nine months of action with a knee injury sustained against Crystal Palace. Vincent Kompany (calf) is a major doubt. This game is too tough to call with both sides in form and both having come through testing European midweek matches. The champions have had a more testing schedule having been away from home and having 24 hours fewer rest, but do possess home advantage which evens out any advantage. The only prediction to make with any real confidence for this fixture, aside from it being close, is that it should contain goals. City are free-scoring while Chelsea netted ten in the past four encounters with Hazard scoring four of those. The Belgian has returned to the fold at Stamford Bridge after injury and looks fresh with an electric showing for the visitors at Atletico Madrid on Wednesday night.